Tippi Hedren (played by Sienna Millier) starred in two of Alfred Hitchcock's (Toby Jones) films: Marnie and The Birds. 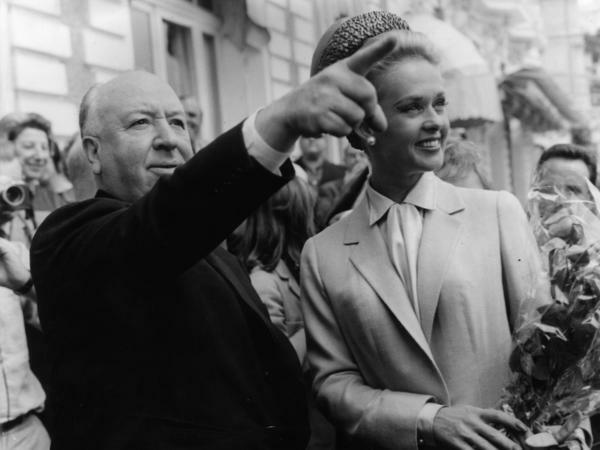 The real Alfred Hitchcock and Tippi Hedren explore Cannes together after the premiere of The Birds in 1963. Hedren collapsed after filming The Birds' iconic attic scene, according to Miller (pictured), who got to know the actress while making the HBO movie. "Blondes make the best victims," according to Alfred Hitchcock. Think Grace Kelly in Dial M for Murder or Janet Leigh in Psycho. A new HBO movie called The Girl explores the unnerving events that went on behind the scenes in his 1963 movie, The Birds. The blond victim — on and off screen — was a young, unknown actress named Tippi Hedren, played by Sienna Miller in The Girl. Hitchcock was riding high in the early '60s. His most recent movie, Psycho, had been nominated for four Oscars. He wanted his follow-up to be bigger and scarier than ever. He plucked Hedren from obscurity after seeing her in a TV commercial. Naturally she was — at first — elated to be cast in a film by one of Hollywood's hottest directors. For actor Toby Jones, portraying one of the most popular, eccentric and analyzed filmmakers of all time was a daunting task. "You have to keep saying, 'Yes, it will be OK' — even in the midst of extreme panic," says Jones. To prepare for the role, he studied Hitchcock's voice, which he describes as a mixture of cockney, Los Angeles, wine and cigars. Particularly useful, says Jones, was the extended interview Hitchcock did in 1962 with French filmmaker Francois Truffaut. "This is Hitchcock very relaxed, and there's candor," says Jones. "Because we only know the public persona of someone, you're always after, well, what's it like when the mask slips." When Hitchcock's mask slipped, he could be controlling, self-loathing and abusive, according to many sources. Probably not surprising, given the dark nature of his films. In the HBO movie, he becomes obsessed with Hedren and tries to mold her into the "perfect blonde of his imagination," as screenwriter Gwyneth Hughes puts it. She based the script for The Girl largely on Donald Spoto's biography of Hitchcock and on interviews with people who worked on The Birds. Hughes says it was a story about life imitating art. "Tippi Hedren, in real life, was a Hitchcock blonde, and his growing interest in her, which became an obsession, was ... the kind of thing he might have made a film about in a different universe," she says. When Hedren rebuffed Hitchcock's sexual advances, there were dire consequences for her career. But that's not the only way she suffered. In the famous scene where she's attacked in the attic, he used real birds instead of the mechanical ones he used for other scenes — this was before CGI special effects. But Hitchcock didn't tell Hedren until just before the filming began. "They had a chain-link fence built around the door [through] which I enter," Hedren told NPR in 2010, "and there were about three or four cartons of raven and seagull, and a few pigeons thrown in, which they hurled at me for five days." "She certainly could've lost an eye. 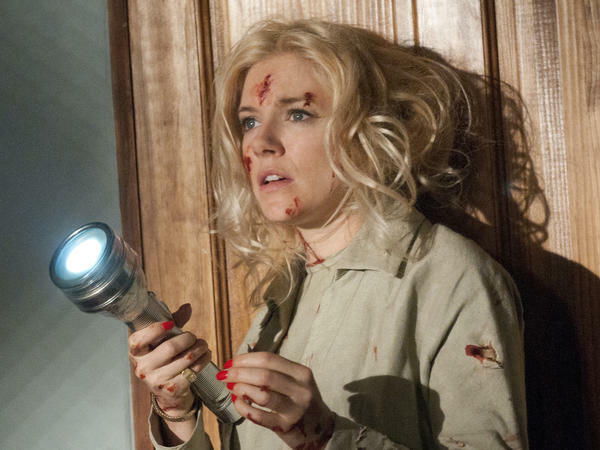 A bird narrowly missed her eye," says Sienna Miller, who got to know the real Hedren during the filming. "She endured an awful lot. She collapsed after that scene and slept for a week. She went through the mill." Had The Birds been made today, Hedren probably could have sued Hitchcock for what he put her through. Julian Jarrold, who directed The Girl, says Hitchcock was indeed a very strange man. "He was obsessed by beauty and almost put [Hedren] on a pedestal like a goddess. But at the same time, he found some kind of beauty in the way she was suffering. ... I think there's a real mystery at the heart of Hitchcock." As for Hedren, she won a Golden Globe for The Birds, and went on to star in Hitchcock's next film, Marnie. She wanted that to be the end of her relationship with Hitchcock, but he wouldn't release her from her contract to let her work with anyone else. Though she would eventually manage to pick up roles in TV and film, Hitchcock's intransigence effectively ended Hedren's run on the Hollywood A-list. She's long said that her proudest achievement is the Shambala Preserve in Southern California, which provides a home for lions, tigers and other big cats that have been mistreated. "He ruined my career," the actress said recently, "but he didn't ruin my life." Alfred Hitchcock's 1963 movie "The Birds" is a terrifying story of a seaside town besieged by flocks of birds that viciously attack human beings. As in many Hitchcock movies, it stars a pretty girl who suffers. In that film, it was Tippi Hedren, playing the socialite Melanie Daniels. The making of "The Birds" is the subject of a new movie, airing tonight on HBO, called "The Girl." As NPR's Elizabeth Blair reports, the story is as haunting as one of Hitchcock's own movies. ELIZABETH BLAIR, BYLINE: Alfred Hitchcock once said, "Blondes make the best victims" - blondes like Grace Kelly, in his movie "Dial M for Murder." BLAIR: Or Janet Leigh, in "Psycho." BLAIR: Or Tippi Hedren, in "The Birds." BLAIR: In one scene, she's brutally clawed and pecked - over and over again - by ravens and seagulls. In the HBO movie, Sienna Miller plays Tippi Hedren. SIENNA MILLER: I mean, it's such an iconic, incredible film. I first saw it, I think, about seven years ago; and it was terrifying. MILLER: Just the concept of something so mundane as a flock of birds turning against you, is - you know, just that it's such a simple idea and yet, you know, everytime we walk outside, we see birds. And it just stays with you forever. BLAIR: The great Alfred Hitchcock was riding high in 1962. His most recent movie, "Psycho," had been nominated for four Oscars. He plucked Tippi Hedren from near-obscurity after spotting her on a TV commercial, and offered her the starring role in "The Birds." BLAIR: The HBO movie shows just how eager, and grateful, Hedren was - at first. BLAIR: Playing one of the most popular and eccentric movie directors of all time, was a daunting task for actor Toby Jones. : You have to keep saying yes, it will be OK - even in the midst of extreme panic. BLAIR: To prepare for the role, Toby Jones studied Alfred Hitchcock's voice. BLAIR: In the fall of 1962, Hitchcock did an extended interview with French filmmaker Francois Truffaut. : This is Hitchcock very relaxed, and there's candor. Because we only know the public persona of someone, you're always after, well, what's it like when the mask slips? BLAIR: And by most accounts, when Alfred Hitchcock's mask slipped, he could be controlling, self-loathing and abusive. In the HBO movie, he becomes obsessed with Hedren, and tries to mold her into the perfect blonde of his imagination - as screenwriter Gwyneth Hughes puts it. She based the script largely on Donald Spoto's biography of Alfred Hitchcock, and interviews with people who worked on "The Birds." GWYNETH HUGHES: Really, life was imitating art, to a great degree, in this story and that - Tippi Hedren, in real life, was a Hitchcock blonde. And his growing interest in her, which became an obsession about her, was a very, very - the kind of thing that he might have made a film about, in a different universe. BLAIR: When Tippi Hedren rebuffed Hitchcock's sexual advances, there were dire consequences for her career. But that's not the only way she suffered. In the famous scene where she's attacked in the attic, he used real birds instead of the mechanical ones he used for other scenes - this was before CGI. But he didn't tell her until just before the filming began. In 2010, Tippi Hedren told NPR what happened. MILLER: She certainly could've lost an eye. I think, you know, a bird narrowly missed her eye. BLAIR: Sienna Miller got to know Tippi Hedren, during the filming of "The Girl." MILLER: She endured an awful lot. She was incredibly exhausted. She collapsed, actually, after the - after that scene, and slept for a week. And, you know, she really went through the mill. BLAIR: Had "The Birds" been made today, Tippi Hedren probably could have sued Alfred Hitchcock for what he put her through. Julian Jarrold directed "The Girl." JULIAN JARROLD: He was obsessed by beauty and almost put her on a pedestal, like a goddess. But at the same time, he found some kind of beauty in the way that she was suffering. He was a very complex, strange guy. And there's a - I think there's a real mystery, at the heart of Hitchcock. BLAIR: As for Tippi Hedren, she won a Golden Globe Award for "The Birds." She went on to star in Hitchcock's next film, "Marnie." She didn't want to work with him ever again. But he wouldn't release her from her contract, to let her work with anyone else. She recently said, "He ruined my career, but he didn't ruin my life." "The Girl" premieres on HBO tonight. Elizabeth Blair, NPR News. Transcript provided by NPR, Copyright NPR.